The Ripple: Cheering on our Native Trout! More than ever our rivers—and other river-lovers—need us. The Massachusetts Department of Ecological Restoration has published a list & calendar of river-helping opportunities. This local offering is a perfect way for those of us who want to do something, to do it! and amorous fish arrive from far out at sea, crowding the rumbling spillways of Holyoke Dam, hoping to catch a ride on a world-famous elevator, so they may have babies upriver where their parents once did. Factory-raised trout have no clue where they are, or even how to hunt for food, and are helpless, hapless imbeciles; yet, for today’s trout fishers just getting into the river, wearing those waders and using that gear, is what it’s all about, even if it’s just a simulation of what they really want to do—catch big, fat, beautiful native trout like the one’s they see their granddads holding in the family picture album. Native trout do survive the century of US Fish & Wildlife Service mismanagement in tiny brooks up in our hilltown headlands, but they are miniature now, having shrunken drastically in size to suit the conditions of their present habitat. There is no doubt that, if the US Fish & Wildlife Service would stop the stocking and overfishing for a few decades, our native trout would descend from their pools of exile and return to their homes in the main courses of our rivers; there they would find plenty of native benthic invertebrates (water bugs) to eat and ample places to breed; in a few generations they would return to normal size, and trout fishers would again be fishing for the trout they want to fish for. Will this ever happen? It might! But not because the government agents who get paid to “conserve” and “protect” our rivers will make it happen. Presently, they have no monetary or cultural incentive to revive the health of our rivers; in fact, they enjoy the annual photos local newspapers publish of them each spring, as they “teach” schoolchildren how to dump finned-zombies into the water. Our native trouts’ best chance at returning to normal size and abundant populations is the termination of the stocking industry due to cutbacks in government spending. Stocking rivers with finned-zombies is expensive, very complicated and unsustainable. As we have seen again and again, when politicians need things to cut, “environmental programs” are the first to go. Soon enough, as we face the costs of, say, rebuilding our public transportation infrastructures, trout-stocking will be viewed as a “luxury.” Ironically enough, this will restore our native trout populations to historical norms—if overfishing is prevented. Will that happen? Saturday, May 9, 9am-1pm – WESTFIELD RIVER: “Walkin’ the Watershed” training, sponsored by the Westfield Wild and Scenic River Committee. “See how easy and fun it is to monitor a section of the river. Skills needed: a love of water and the ability to walk along a river bank.” Contact Meredyth Babcock at 413-623-2070 or volunteer@wildscenicwestfieldriver.org for more info. Kurt Heidinger, Ph.D. is the Executive Director of Biocitizen, non-profit school of field environmental philosophy, based in the Western MA Hilltown of Westhampton, MA where he lives with his family. Biocitizen gives participants an opportunity to “think outside” and cultivate a joyous and empowering biocultural awareness of where we live and who we are. Check out Kurt’s monthly column, The Ripple, here on Hilltown Families on the 4th Monday of every month to hear his stories about rivers in our region. Make the world of rivers bigger than the world of pavement inside of you! Given the apparent failure of Atlantic Salmon restoration, re-establishment and better management of wild Brown Trout fisheries might not be a bad idea, since they belong to the same genus and in some ways are ecologically similar. 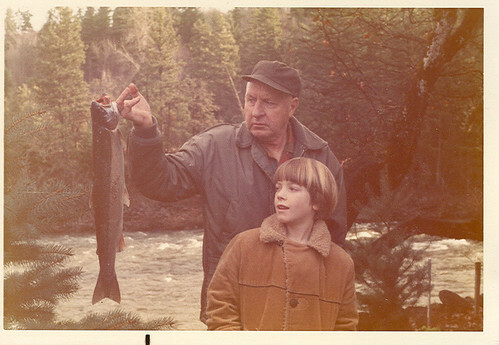 In tributaries of the Westfield River I fished many years ago, Brown and Brook Trout coexisted up to barrier falls, with spawning Brown Trout apparently coming up from the main river. Above these falls, native Brookies were the only salmonoids. Since Brown Trout more readily withstand angling pressure, this seems like a viable solution. To me, wild Brown Trout seem less alien than the Rainbow variety, that isn’t naturally found anywhere in the Atlantic Basin. As a trustee of property with no less than five coldwater brooks, we have seen little interaction or input from the state on managing these resources. We would like to see a cessation of stocking these streams, no-kill regulations, and stream improvement, particularly in a stream next to a paved road that needs more shade and less sediment. Increased acidification is also a problem greatly affecting natural reproduction. We are having problems with beavers virtually extirpating Brook Trout on one stream, by creating large, shallow, stagnant, warm and unshaded impondments. Despite assurances that beaver improve water quality, this certainly has not been our outcome. Steve, thank you for your insightful comment, which clarifies & extends the idea I tried to express. What drives me the craziest is that the government & Trout Unlimited use the stocking program to teach environmental education to students, & host major PR events to promote the idea that stocking is a great thing, and should be supported by nature-lovers. These events give slightly-informed people the feeling that our rivers are being cared for, when actually the program is designed to hide the disastrous state they are in. Ken Simmons, chief of hatcheries for the Massachusetts Division of Fisheries and Wildlife explains that industrialists destroyed our riverine fish communities, and that stocking was introduced in 1870 so anglers wouldn’t have a sad. Unfortunately, he then expresses this falsehood: “fish stocking also helps protect the ecosystem from overfishing.” Notice how his worldview neglects the fact that our rivers are “overfished” because 1) they underpopulated by fish because 2) they remain in the same state of collapse as in 1870. What we want is what he is not providing—we want healthy rivers with healthy fish communities, and a management regime & environmental education that prevents overfishing. Our problem in Western MA is typified by the state of the East Branch of the Westfield River, which is a federally-listed “Wild and Scenic River” & state-listed “cold water fishery” that has native trout in it—yet IS stocked. Not only that, Trout Unlimited holds an annual fishathon there in May, belying the words of Paul Beaulieu, who apparently organizes this event that is synchronized with the dumping of the finned-zombies. It is a crazy upside-down inside-out situation! Trout in the Classroom (TIC): WRWA provided chillers and tanks (and other supplemental equpment) for five local schools (7 tanks) to participate in this program during the Spring of 2015. This year’s schools were the North and South Middle (2 tanks each) Schools in Westfield, Gateway Regional Middle School in Huntington, Powder Mill Middle School (2 tanks) in Southwick, and Berkshire Trails Elementary in Cummington. About 100 brook trout eggs were delivered to each site in January. Students will monitor the hatching of the eggs and feed the young fish until they are stocked in local streams in April or May. This program, sponsored by Trout Unlimited and MA Division of Fisheries & Wildlife, replaces the Atlantic Salmon Egg-Rearing Program, which many of these schools have been participating in for 5-10 years. Kurt, I have always compared the over stocking of non native trout with what it would be like to dump huge herds of elk in our state forests, on an annual basis. No one would ever consider this to be a good idea. They would eat up all the available vegetation out competing the native white tail deer while browsing themselves into a starvation situation if they were not all killed the first year. The stocked trout probably have a greater impact on the rivers and even less chance of survival. Not only could we have a native trout revival but also far greater numbers of small mouth bass in warmer sections of our rivers. And then there are the farm raised pheasants you would have to kick to get to fly before shooting them.